As the old saying goes, form is only temporary. But what makes a player's performance suddenly drop in quality from one season to the next? Injuries, personal problems, being played out of position, moving clubs, loss of confidence, lack of motivation, falling out of favour, managerial changes, the ageing process – there are many reasons why a player can go from being one of the league's top performers one season to putting in mediocre or poor performances the next. Using unique player ratings from whoscored.com, this article looks at the top 5 drops in form from last season to this season so far, and aims to analyse the possible reasons for these dramatic drops in form. (*Note: Only players with total appearances in each season greater than the average number of Premier League appearances in that season are discussed in this article. Therefore the likes of Papiss Cissé and Gylfi Sigurdsonn are not included due to the fact they did not play more than 19 matches last season). It seems harsh to include Valencia in this list as he is not by any means having a terrible season. A rating of 6.91, while not spectacular, is respectable and has the Ecuadorian close to the top 100 Premier League players so far this season. But according to whoscored ratings, there has been a steep drop in performance compared to last season where he was one of the ten top performers. The short answer is that Valencia has stopped being the same lethal assist-machine he was last season. In 27 appearances last season (5 of which came as a substitute) Valencia notched up a hugely impressive 13 assists, the second highest in the league. When taking into account the amount of games played, nobody could top Valencia's assist-per-game ratio – close to 1 assist every 2 games. He was on fantastic form down the United right-flank, a constant outlet capable of beating his man and providing the perfect ball for a United player (usually Rooney) to slot home. 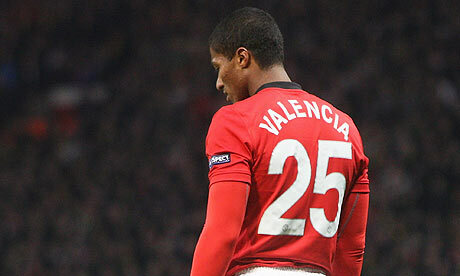 Valencia also chipped in with 4 goals of his own. This season he has assisted just 4 goals so far, with his assist-per-game ratio dropping to about 1 assist in every 5 games – not terrible, but a significant drop nonetheless. He is also yet to score in the Premier League this season. There is one key stat which explains this drop in assists (and by association his rating) – his cross accuracy. Last season a massive 35.3% of Valencia's crosses found their man, whereas this season this has dropped off to a less impressive 19.8%. Looking at the dribbling stats, Valencia is still maintaining an effective ability to beat his man, but his end product as represented by his crossing and key-passes-per-game (down from 2.4 to 1.4) has not been as effective. The arrival of Robin van Persie and, to a lesser extent, Shinji Kagawa. United made two key signings in attacking areas in the summer and this upset the status-quo in United's offensive play that Valencia so enjoyed. This was evident from the first match of the season against Everton when he was forced to play right-back to accommodate the new personnel. Rafael has since nailed down this spot and Valencia has returned to his favoured right-wing position. However, the system has changed somewhat and so has the main man in attack. A big reason for Valencia's excellent performances was his understanding with Rooney. He seemed to know exactly where and when Rooney was going to make his run. The introduction of Van Persie as the main centre-forward has broken up this relationship as Rooney generally plays a deeper role to accommodate the Dutchman. Valencia has not been quite as effective as a result. Another reason could be that Valencia has been singled out by defenders after his deadly performances last season. While it would be unfair to label Valencia a 'one trick pony', he is a direct winger who generally tries to beat his man on the outside before putting in a right-footed cross. Defenders may have 'worked him out' or perhaps have simply began administering special attention to Valencia, doubling up on him or fouling him to nullify his threat – he is being fouled more than last season (up from 0.6 a game to 0.8) and has also been dispossessed more (up from 1.1 per game to 1.5). Swansea City's Dutch goalkeeper was labelled as one of the buys of the season last year as he helped the Welsh club to an excellent 11th place finish in their first Premier League season. His rating of 7.03 was the highest of all goalkeepers in the league and he was linked with several top clubs during the summer. However, this season, under a new manager and after suffering an injury, Vorm's form (a bit of a tongue-twister that) has regressed. Last season Vorm kept 14 clean sheets in 37 games (roughly one clean sheet every 2.6 games) yet so far this season he has only managed 4 in 16 matches (one in every 4 matches). It's difficult to pinpoint one area where Vorm's game has dropped. His save percentage has decreased nearly 5 % (from 74.9% last season to 70.1% this season), though this is perhaps not a significant drop. His pass accuracy has also gone down slightly. Vorm is known to be great with his feet and under Brendan Rodgers' possession-based football he had the highest pass completion percentage of all goalkeepers in the league – 70.6%. This has dropped this season to 62.5%, though this may be down to a slightly more proactive, direct approach under Laudrup than a decline in the passing of the player. Vorm is known as a great penalty stopper. Last year he lived up to his reputation, saving 2 out of the 3 penalties faced, winning vital points for his team. This year, of the 3 penalties so far faced, all 3 have been conceded. But with such a small sample size, a large degree of variance is always possible here, and it would be unfair to suggest that Vorm is worse at saving penalties this year. Perhaps more than any other area, his low rating is most attributable to the amount of errors he has made that have led directly to goals – 3 already this season compared to none last. More than any other position, goalkeepers are exposed and punished by errors, and the consistent Vorm of last season has been more error prone of late. To a large degree, variance. More than any other position goalkeepers will be affected by variance as the margins are so fine and so decisive – the difference between a clean sheet and a goal concession might be the width of a finger that turned a penalty round the post, or guessing the right way to dive. It would be unfair and unrealistic to expect Vorm to maintain a penalty save percentage of 66% through his whole career. Simply put, 'luck' (or, more aptly, variance) was on Vorm's side last year, whereas this year it has perhaps betrayed him somewhat. However, there could be other factors at play. Last season Vorm's ball-playing abilities were almost as important as his shot-stopping as Swansea looked to keep possession for as long as possible to prevent opposition imposing dominance on the match. While Laudrup is far from a long-ball manager, this change in manager and system means that Vorm is not called upon quite so often to utilise his excellent passing skills. Another big factor was the injury he sustained in October which kept him out until December, and perhaps more importantly, the form of his deputy Gerhard Tremmel in his absence. The German performed excellently (with a whoscored rating of 7.1), and a combination of this and Vorm's own shaky form has made it unclear who is the current number one at Swansea at the moment. Vorm's place is no longer guaranteed, a situation which would have been almost unthinkable last summer. It could be argued that the disruption caused by his injury and being unsure of his place in the side has affected Vorm's performances. With an average rating of 7.11, Joe Allen was the shining star of a Swansea side that surprised everyone last season with their excellent passing ability and possession-based football. Allen's role was integral to this system, so much so that Brendan Rodgers brought him with him to Liverpool in an attempt to integrate this style of play in his new club. However, a disappointing rating of 6.59 and a generally poor season for Liverpool suggests that he has struggled to do so thus far. Firstly, his defensive contribution has slackened slightly – at Swansea he made 3.1 tackles per game, but at Liverpool this has dropped by over a third to just 2 per game. Coupled with this is a slight drop in the amount of interceptions he has made. One might argue that this is due to having to defend less as he is now playing at a bigger club, but the fact that Swansea had the same average amount of possession last season as Liverpool this season (58%) would seem to counter this claim. Allen was bought predominantly to retain and distribute possession through his composure on the ball and passing ability. Surprisingly enough, statistically speaking, there is not much of a drop off in this area of his game – his pass accuracy and amount of passes have only decreased minimally. There is perhaps some significance in the slight decrease of key passes played – down from 1.3 a game to 0.9, but other than this the statistics suggest Allen is passing almost as well as last season. Offensively, Allen has contributed nothing this year for Liverpool in the Premier League – not a single goal or assist (nor has he looked close to doing so). It might be unfair to expect this from him, as the final third is not really where he is expected to do much of his work, but last season Allen managed to contribute something – 4 goals and 2 assists. While chance creation is not his game, Allen completed at least a small amount of crosses and through balls last season – this season, however, Allen has not completed a single cross or through ball. Added to this, his shot per game ratio has more than halved, resulting in a practically non-existent attacking threat from the Welshman. Allen could point to the fact that he is still finding his feet at a new club – however his performances have not improved as the season has gone on (in fact they were better at the start of the season), and considering he is working under the same manager this excuse is negated even further. An obvious explanation for Allen's drop in form is that he is struggling to deal with the pressure and expectation that comes with playing for a club of Liverpool's stature. Last season he had nothing to lose, playing for a team that most expected to be relegated. This season every performance is scrutinised by millions of fans worldwide. Coupled with this is the weight of expectation that a £15m price-tag brings. One can only speculate to what extent these factors have effected Allen mentally. But perhaps another significant reason is that he has yet to really nail down a specific role in the team – Lucas's injury in the second match of the season meant Allen began his Liverpool career covering as a deep-lying defensive midfielder. He actually did a decent job deputising here – his rating as a defensive midfielder is a fairly respectable 6.84. However, since Lucas's return, he has struggled to fit in in an unbalanced Liverpool midfield. This season Gerrard's role in the team has changed significantly – he is no longer the attack-minded midfielder who scores goals and makes runs into the opposition box. Instead he has begun to play a much deeper, playmaking role in centre-midfield, as age begins to catch up with him. This change has left Allen floundering without a position in the first team to call his own. We have seen in the losses to Manchester United and Aston Villa recently that a combination of Lucas, Gerrard and Allen is unbalanced and does not work as they all play too deep to function together. 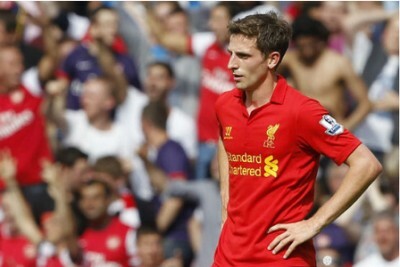 Allen was given the role of the most advanced midfielder against United, and he performed poorly. This was no surprise. As we have seen from his stats, Allen has never been an effective player in the final third, even when he was on good form with Swansea – this is not his role nor has it ever been. Rodgers has now given up on this trio in midfield, and it was inevitably Allen who has made way to the bench. Since Lucas came back from injury Allen has had to play the majority of games as part of an unbalanced midfield, out of position as an advanced midfielder, or had to make do with just 5 or 10 minutes playing time off the bench – Allen's average rating during this period is an extremely low 6.24 (only two players in the Premier League have a lower rating than that this season). Samir Nasri takes second place on this list, after failing to build on a good first season where he contributed some important goals and assists during Manchester City's successful league campaign. His rating of 6.70 can be described as mediocre at best, but when taking into account his massive wages and the fact he is playing for the reigning Champions who are expected to win most games, it appears particularly poor. Nasri is not assisting or scoring goals at the same rate as last season. In Manchester City's title winning season Nasri scored 5 goals and set up a further 9 in 30 appearances (4 of which were as a substitute). In other words, roughly every 2 games he was contributing towards a goal. This season, in 18 appearances (4 as a sub), he has scored just once, and made three assists, translating to a goal contribution only every 4.5 matches. Looking at his offensive and passing stats, it's actually quite difficult to see where exactly it's going wrong for Nasri. He has maintained a very high pass completion percentage, he is dribbling past opponents with the same frequency, his crosses are seemingly as accurate and he is not being dispossessed any more than last season. However, with Nasri's role as a creative midfielder rather than a traditional winger in an attack-minded team there is one very important stat that stands out – the amount of through balls played. Last season Nasri was one of the few through ball masters of the Premier League, playing the joint second most successful through balls per game – 14 defence-splitting passes in his 30 appearances, or close to one in every two games. Considering that playing a successful throughball results in a relatively high possibility of a goal, and given the fact that they are such a rare occurrence, even what might seem like a modest drop in this statistic can be very significant. This year Nasri has completed just 3 through balls – or roughly one in every seven games. The reason for this tail-off is not down to poor execution, but instead due to a decrease in the amount he has attempted. Last year he attempted close to 41 through balls (1.5 per game) whereas so far this season he has attempted a grand total of just 6 (.3 per game). This has inevitably led to a significant drop in scoring chances he has created. Not only is Nasri not risking so many game-changing passes, but he is also attempting fewer shots – last season he shot at goal twice a game on average, whereas this year this has halved to just one shot per game, so his paltry goal tally of just one goal could be attributable to this. Finally, a red card against Norwich and an error against city rivals Manchester United have both contributed towards a poor rating so far this season. Unlike Valencia and Vorm, Nasri can apportion a certain amount of blame onto his fellow teammates – Nasri is not the only player struggling for form at City this season. Last season Nasri's club were dominant, but this year they have stuttered, failing to mount a serious defence of their title. It can be difficult to play well in a team that is struggling as a whole. However, Nasri has been a key part of this collective failure and has stood out more than his teammates (hence his inclusion on this list) so this excuse only stretches so far. So what explains Nasri's drop in performances beyond this explanation? The significant drop in the amount of through balls and shots attempted might suggest a drop in confidence – if a player is not attempting the risky, difficult moves that can make you look like a genius or a fool then perhaps it is because the player is not feeling confident in his ability to execute them. However, Nasri might also argue that a lack of movement in attack has allowed fewer opportunities to play the type of goal-creating passes he played last year – key striker Sergio Aguero was injured for several matches at the start of the season and has not quite been in the same deadly form as last season; Tevez is not the type of striker that routinely looks to run onto defence-splitting passes behind the defence; Edin Dzeko is more effective converting crosses from a traditional wide-man, rather than a creative passer like Nasri; and the recently departed Balotelli was simply awful when called upon this season. 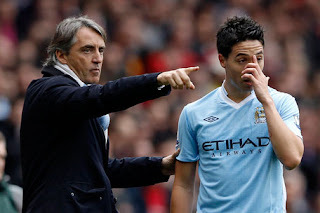 A final reason (a reason that many disgruntled City fans who have lost patience with Nasri's performances will point to) could be simply a lack of effort and motivation. His vital error in the last minute against Manchester United – where he shirked his responsibilities in the Man City wall, hiding behind Dzeko and sticking a lazy leg out which deflected Van Persie's free kick into the corner of the goal – was, for many, indicative of a player who does not show enough fight on the pitch. Topping this list, and claiming the undesirable title of the the Premier League player who has seen the most drastic dip in form this season, is Tottenham's Emmanuel Adebayor. The Togolese striker has failed to reproduce his performances from an impressive first season with Spurs where he was the fifth highest ranked striker, productive with both goals and assists, attaining an excellent rating of 7.22. This season he has seen his rating plummet, dropping more than any other other player in the Premier League. 17 goals and 11 assists in 31 matches last season translated to Adebayor contributing towards a goal almost every game last season – Van Persie, Rooney and Aguero were the only strikers that could boast better goal contribution stats. This impressive record has dropped dramatically to just 2 goals and 0 assists in 16 appearances this season. Adebayor is simply not creating or scoring at anywhere near the same rate as last season. Looking at the stats to explain this decline, we can see that Adebayor's shooting ratio has halved this season – from 3 shots a game to 1.6, suggesting he is not getting into the same positions as last year, or is not willing to try his luck quite so often. His key passes have also decreased slightly – from 1.8 per game to 1.2. We saw in our discussion of Nasri the importance of throughballs – Adebayor played 7 successfully last season but has managed just 1 so far this season. Added to this is a slight decrease in the amount of Aerial Duels won – an important statistic for a player of Adebayor's style – down from 1.9 per game to 1.5. A red card after just 18 minutes in the North London derby has not helped his cause either. An explanation symathetic towards Adebayor would suggest that the sacking of Harry Redknapp and appointment of Villas-Boas has been the main reason for his loss of form. Villas-Boas plays a different formation and style to his predecessor, and it might be argued that Adebayor's languid style and ability to play as a target man does not fit the new playing philosophy introduced at the club. Added to this, Adebayor might argue that he has not had an extended run in the first team. With just one striking role at the club, the Togolese international has seen his appearances limited (6 of his 16 appearances have come as a substitute), as Jermaine Defoe has been favoured in attack. Injuries, suspension and participation at the African Cup of Nations have further disrupted his season. Adebayor has perhaps not had chance to settle and make an impact in a newlook Spurs team. 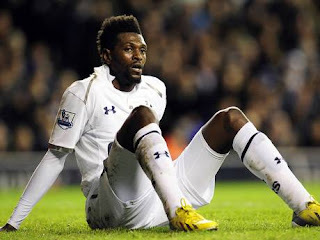 The departure of Van der Vaart and Modric may also have impacted heavily on Adebayor's performance. With two key men leaving (as well as a new manager) the balance of the team has changed significantly and Adebayor may still be having trouble adapting. Van de Vaart's departure in particular will have effected him – playing in behind Adebayor last season, the Dutchman complemented him perfectly and many of Van de Vaart's 11 goals last season were set up by Adebayor. A more cynical explanation for Adebayor's poor displays this season is his contractual situation. It might be suggested that the Togolese forward, on loan from Man City last season, was playing for a contract at Spurs, and, now that he has achieved a permanent deal, he is no longer making the same effort. Dietmar Hammann seems to hold this opinion, questioning Adebayor's mentality and focus during Tottenham's dramatic win over West Ham last night – 'talent counts for nothing if you don't have the right head on your shoulders' he tweeted. For a player who has a history of changing clubs frequently, there might be something to this theory. With Defoe's recent injury, Adebayor has been given the chance of a sustained run in the Spurs attack and prove his critics wrong, though the signs so far suggest he may not seize it. As stated earlier, only those who have appeared in a greater number of matches than the average amount have been included. However, if we were to include those who signed in last season's January transfer window then the list would look quite different. If Papiss Cissé had been included he would almost certainly have topped the list. He took the Premier League by storm at the end of last season, scoring 13 goals in his 14 appearances. This season he has been comparitively very disappointing, with a rating of just 6.59. Gylfi Sigurdsonn (6.44) and Nikica Jelavic (6.70) are two other players who would have contested this list, having both failed to build on impressive starts in the Premier League at the end of last season. Mario Balotelli has played enough games in both seasons to be included in this list, but I made the decision to leave him out due to his recent departure to Serie A. However, with a rating drop of 0.68 (down from 7.01 to 6.33) he would have pipped Adebayor at the top of this list. Excellent article Erwin. Very comprehensive.